In this Photoshop tutorial, we're going to learn how to save, load and reuse layer styles! Photoshop's layer styles are a great way to create fun and interesting photo effects and text effects without requiring a lot of effort, or even a lot of skill. You don't need to be a Photoshop guru or spend your life studying light and color theory to begin applying drop shadows, strokes, gradients, patterns, inner and outer glows and more to your images with layer styles, creating everything from subtle color effects to the wildest and craziest text effects anyone's ever seen. In fact, the only thing you really need to benefit from layer styles in Photoshop is a willingness to play around and experiment. That, plus it also helps to have some free time on your hands, since layer styles can become a bit of an addiction. If free time is in short supply, not to worry. Photoshop makes it easy to save our layer style creations so we can easily re-apply them to other images without having to redo any of the steps! In this tutorial, to give us something to work with, we're going to be creating a simple photo frame using nothing but layer styles. When we're done, we're going to save the completed effect, and then we'll see how to apply the exact same photo frame to a different image instantly! 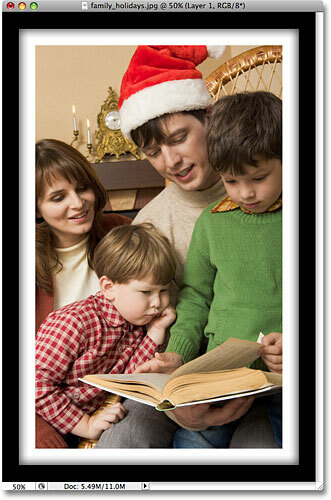 A simple photo frame created with layer styles in Photoshop. Keep in mind that the photo frame itself is not the main focus of this tutorial, although you're certainly free to follow along with the steps and use the completed frame with your images. The point of the tutorial, though, is to learn how easy it is to save your own layer style effects, load them back into Photoshop when needed and then apply them instantly to other images. The Layer Styles icon appears grayed out and unavailable for the Background layer. A copy of the Background layer appears above the original in the Layers palette. Now that we have a copy of the Background layer to work with, we can begin adding our layer styles! Select Stroke from the list of layer styles. Select black from the Color Picker. 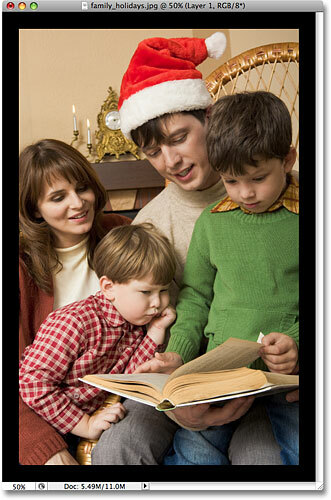 Change the Position of the stroke to "Inside", then increase the Size to create the black border around the image. A black border now appears around the inside edges of the photo. Don't click out of the Layer Style dialog box just yet. We still have a couple more layer styles to add before our photo frame is complete. We've created the first part of our photo frame, using the Stroke layer style in Photoshop to add a black border around the inside edges of the photo. This time, let's add a white border just inside the black one. Unfortunately, we can only use a particular layer style once per layer, which means that since we've already used the Stroke layer style to add the black border, we can't use it again unless we create another new layer and apply a completely different set of layer styles to it, which isn't what we want to do. So, since we want to add something that looks like a white stroke, but we can't use the Stroke layer style because we've already used it, we're going to have to get a little creative. Click on the color swatch to change the color of the inner glow. 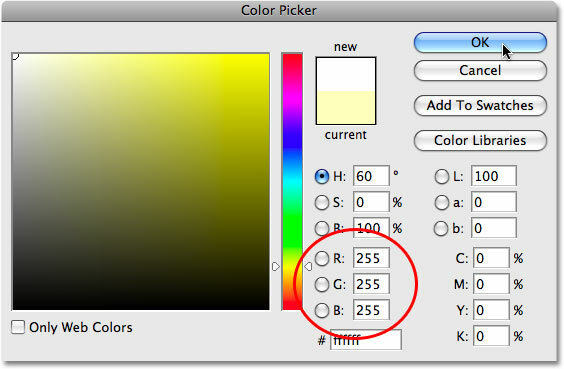 Choose white for the inner glow color using the Color Picker. With the color now set to white, we have a few options that we need to change in order to make our inner "glow" look more like an inner "stroke". First, near the top of the dialog box, increase the Opacity of the inner glow to a full 100%. Next, in the center of the dialog box, change the Technique option to Precise. Down at the bottom of the list of options, decrease the Range option down to 1%. Finally, back in the center of the dialog box, drag the Size slider to increase the size of the glow, which will now appear as a stroke thanks to the options we've changed. The glow actually begins at the edges of the photo, not the edges of the black stroke that we applied a moment ago, which means that as you drag the Size slider to the right, you won't actually see the white border appearing in the image until you've increased it beyond the size of the black border. If you recall, I set the thickness of my black stroke to 60 pixels, which means I'll need to increase the size of my white inner glow beyond 60 pixels before I'll see it in my image. 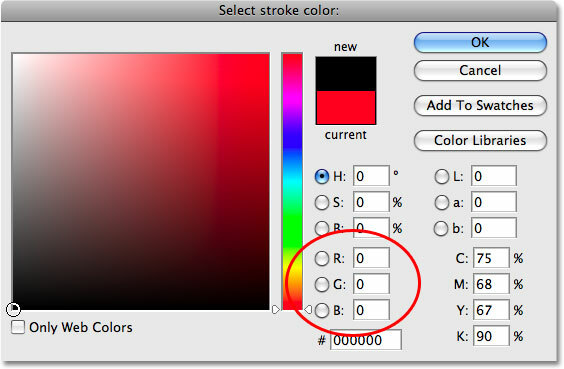 Change the options circled in red to make the inner glow appear more like a stroke. The photo frame now has an inner white border and an outer black border. Let's add one more more layer style to complete the frame, and then we'll see how to save it so we can instantly apply it to a different photo without having to redo any of these steps! Click directly on the words "Inner Shadow" on the left of the Layer Style dialog box. Add some depth to the photo frame with the Inner Shadow layer style. The completed photo frame effect. Our photo frame is now complete! There may have only been a few steps involved in creating it, but this was just a simple example of what you can do with layer styles. Throw in an Outer Glow style, a Color, Gradient or Pattern Overlay, or a Bevel and Emboss effect, all with different options and settings you'll need to remember and suddenly, having a way to easily save the completed effect so you can instantly apply it again later seems like a pretty good idea. Save the completed layer style by clicking on the "New Style" button. Photoshop will pop up the New Style dialog box, allowing us to name our new layer style. I'm going to name mine "Simple Photo Frame". At the bottom of the dialog box are couple of options that we can usually ignore because Photoshop does a good job of automatically selecting these options as needed, although it still helps to know what they're used for. The first one, Include Layer Effects, deals with whether or not we want to include the individual effects that we've used such as our Stroke, Inner Glow and Inner Shadow. Technically speaking, these individual styles are called layer "effects", and when you combine them for different results, you end up with a layer "style". However, most people just use the term "layer style" whether they're referring to an individual effect or a combination of several effects. Since we obviously want to include the individual effects that we've used to create our photo frame, this option is automatically selected for us. The "New Style" dialog box. Click OK when you're done to have Photoshop save the layer style and exit out of the dialog box. 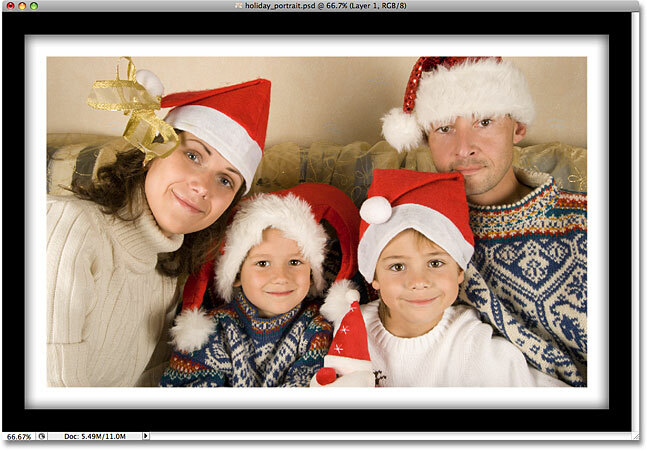 You can also close out of the Layer Style dialog box at this point, since we're now finished with our photo frame. Remember to duplicate the Background layer first before attempting to apply any layer styles. You'll find any and all layer styles that you've created and saved, along with the ones that Photoshop loads for us as part of the program, sitting in the Styles palette (with "Styles" being short for "Layer Styles"). By default, the Styles palette is grouped in with the Color and Swatches palettes. You'll need to click on the name tab at the top of the Styles palette to bring the palette to the foreground if it's hiding behind one of the other two palettes in the group. If you don't see the Styles palette at all on your screen, simply go up to the Window menu at the top of the screen and select the Styles palette from the list. Click on the layer style you want to apply in the Styles palette. 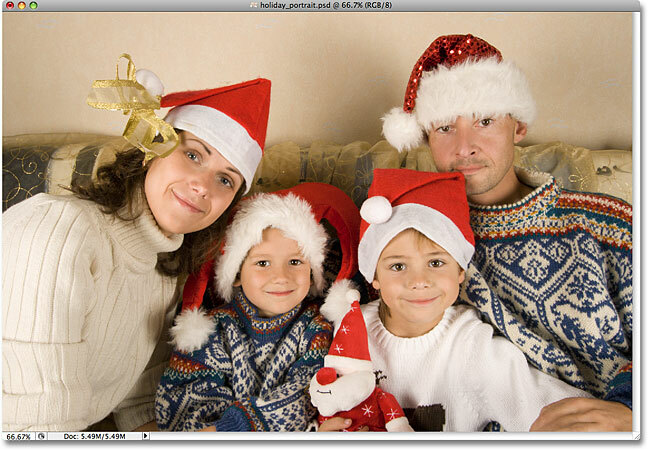 The photo frame layer style is instantly applied to the new image. One important thing to keep in mind is that even though we've saved our photo frame layer style and it's appearing in the Styles palette for us to select and apply whenever we need it, it's currently only saved temporarily. Basically, it's saved inside Photoshop, which is fine until Photoshop crashes and we need to re-install it or we upgrade to a new version of Photoshop. If, for any reason, Photoshop needs to be re-installed, we'll lose our photo frame layer style, along with any other layer styles we've created. Fortunately, Photoshop allows us to save permanent copies of our layer styles (or at least, as permanent as you can get with computers) which we can load back in any time we need them. We'll see how to do that next! Go to Edit > Preset Manager. There is an option directly in the Styles palette for saving layer styles, but it doesn't give us any control over which styles we save. All it can do is take every layer style that's currently loaded into Photoshop and save them all as one big group, which usually isn't what we want to do. The Preset Manager, on the other hand, allows us to pick and choose exactly which layer styles we want to save. Select "Styles" from the "Preset Type" option. Select your layer style(s), then click on the Save Set button. Name your new style set and choose a location to save it to. When you're finished, click Done in the top right corner of the Preset Manager to exit out of it. Your layer style is now saved safely outside of Photoshop, so if Photoshop happens to die on you, it won't take your layer style along with it! Of course, if your entire hard drive crashes, well, that's another story. Select the "Load Styles" option from the Styles palette fly-out menu. Navigate to where you saved your style set, select it from the list, then click the "Load" button. The layer style is now loaded back into Photoshop and appears inside the Swatches palette. And there we have it! Visit our Photoshop Basics section to learn more about the basics of Photoshop! All of our Photoshop tutorials are now available to download as PDFs!